49 w w w . M o d e r n T i r e D e a l e r . c o m tire," said Wade. Features include a wheel weight usage tracker, which helps shops make accurate wheel weight purchases. Kevin Keefe, vice president of service and sales support, said Hennessy has been building service capacity. e company has more and better equipped service trucks on the road and has expanded its call center team. It has also invested in technology to centrally dispatch all service requests directly to service techs connected in real time to the company's systems. "We've been investing in the capability and capacity to take care of our customers' existing equipment, which will last them years," said Keefe. NEW TPMS DIAGNOSTIC SYSTEM 31 Inc. introduced the Smart Sensor Elite, a diagnostics/programming tool for tire pressure monitoring system (TPMS) service. Features include built-in relearn procedure, VIN (vehicle identification number) scan- ning, OBD II reset, Wifi tool updates, and wireless Bluetooth connectivity. Sensors can be programmed when they are inside of the tire, adding convenience and speed. Also new to the Smart Sensor program is the ability to change placard values. 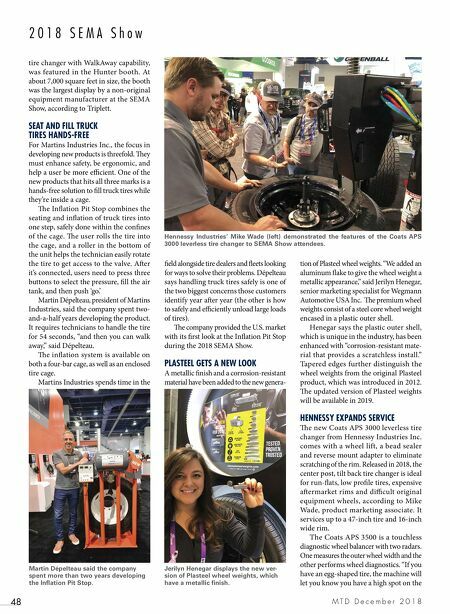 Updates are free for the life of the tool, according to sales manager Dave Kovach. He said the tool is as easy to use as the current Pro+ tool, but loaded with so much more for users. "e Elite is a game-changer, everything works so smoothly." The Tire Industry Association (TIA) inducted two members to the Hall of Fame and presented the Ed Wagner Leadership Award to a pair of honorees during the 2018 Tire Industry Honors Awards Ceremony. The Hall of Fame honorees are: Bob Majewski, president of Sumerel Tire Service Inc. and Arvind Poddar, chairman and managing director of Balkrishna Industries Ltd. (BKT). 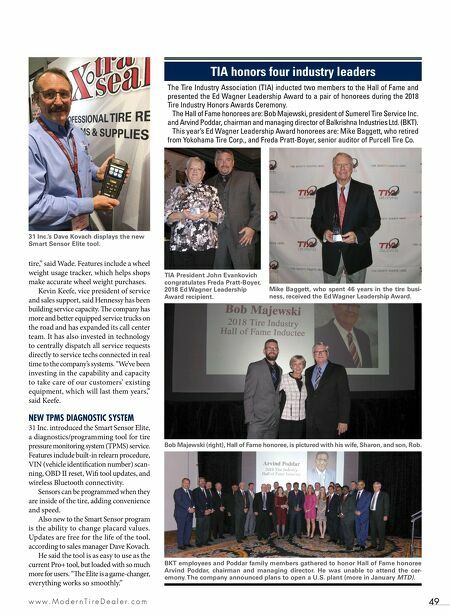 This year's Ed Wagner Leadership Award honorees are: Mike Baggett, who retired from Yokohama Tire Corp., and Freda Pratt-Boyer, senior auditor of Purcell Tire Co. TIA honors four industry leaders Mike Baggett, who spent 46 years in the tire busi- ness, received the Ed Wagner Leadership Award. Bob Majewski (right), Hall of Fame honoree, is pictured with his wife, Sharon, and son, Rob. BKT employees and Poddar family members gathered to honor Hall of Fame honoree Arvind Poddar, chairman and managing director. He was unable to attend the cer- emony. The company announced plans to open a U.S. plant (more in January MTD). TIA President John Evankovich congratulates Freda Pratt-Boyer, 2018 Ed Wagner Leadership Award recipient. 31 Inc.'s Dave Kovach displays the new Smart Sensor Elite tool.